Do Car Dealers Still Rip People Off? If video killed the radio star, perhaps the internet killed the sleazy-car-salesman stereotype. Of course there are always going to be salespeople that only have their own best interest at heart, but thanks to the internet it is much more difficult for car dealers to manipulate a customer like they could back in the ’70s and ’80s. All a customer has to do is enter the information for the vehicle they want into Google and can determine right then and there if they are getting a good deal. As discussed in an article from Dealer Bar, the auto industry is very unique in that, “As consumers, we don’t blink an eye when buying a couch or a shirt that brings in 50% or more profit to the retailer, but car dealers often struggle to make 4% off of a vehicle sold”. Of course dealerships are still making money, but this distinction is something that car buyers should consider. Facebook, being the largest social media network (with about 1.5 Billion active users) has always tried to close the gap between their users and other sites. The more they can roll into facebook the more time their users will spend on facebook. This is why it was no surprise when facebook took a giant leap in the reviews world by launching their new Best Professional Service site. A customer walks into your dealership. They start looking at cars. And – like the over 1 billion people around the world – at some point they decide to check Facebook. Normally they would scroll through their newsfeed, see what their friends are doing, and check whether they have received any new messages. At your dealership, they see something different. They are greeted with a beautifully-designed notification welcoming them and offering to show them the current OEM special you are running that month. They click the notification and are taken to a page where they can see information, photos, and posts from your business. They can also see any interactions their friends have had with your dealership. This new way of interacting with your customers is the next step that Facebook is taking to help you connect you and your customers. Just in time to start the new year, Strathcom is giving you the chance to strike off one of your digital resolutions: get a better understanding of search engine optimization. Even if you already trust your dealer website’s SEO duties to our development, content, and web design teams, it doesn’t hurt to know some of the finer points for yourself. Ready to pop open the hood and learn how to tell a redirect apart from a responsive design? 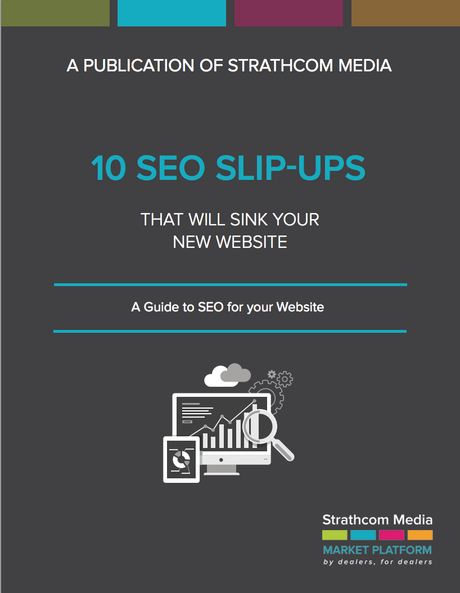 We’ve extracted today’s best online practices from across the web and placed them into one learning resource for the uninitiated: 10 SEO Slip-Ups That Will Sink Your New Website: A Guide to SEO for Your Website! This new ebook — the first in a trilogy set to publish this month — will take you by the hand and guide you step by step through the sometimes comfusing world of search engine optimization, helping you to identify and avoid the most damaging SEO pitfalls and pratfalls. It’s a quick read, written for the layman, and totally free to download! But save your gushing letters for another time; a more intuitive, speedier web experience is thanks enough for us — and your customers! Follow the link below to download your ebook! The Automotive industry has changed, have you? The complete change in marketing for auto dealers in the past few years really is enough to make one’s head spin. There has always been a sink or swim attitude within the car biz, and that has continued with managers now expected to be experts in social media, SEO, SEM and Google Analytics. There is, for the most part, a slap dash attitude towards online marketing. For those in high places it can be an intimidating and often difficult task to ask for help. Many managers I speak to whilst on my travels find relief in telling me that they learned a lot, or are looking forward to learning a lot more about online marketing. But they often wait until after the TOAST presentations, when the room has cleared, to talk candidly about their shortcomings. I recently joked with a couple of managers from BC that there is an “AA feel” to proceedings, of course nowhere near as serious. But the similar “we need help, but we just don’t know where to start” phrase is something I have heard across Canada when it comes to online marketing. In addition to this, there is pressure from above to make results tangible and highly visible. That, I believe, is wherein lies the problem. In olden times, spending on an ad could be justified with an audible radio advertisement or star-burst-filled, three-to-choose-Canada-day-special center spread in a local rag. Such expenditures cannot be so similarly justified online: Adword campaigns, Blogs and well-written web content are of the utmost importance. They also cost money and time to produce effectively. But the results cannot be seen or heard on completion of their design or implementation. They cannot be “paraded” at a Saturday morning meeting with the promise of “making the phone ring.” They are more effective than that, and they are ongoing. And success can be measured. Online marketing can be measured with incredibly accurate tools such as Google Analytics or even something as simple as the “back end” of one’s own website provider. But for upper management, the attitude should be changing: you have to believe that online marketing works. It is difficult to quantify and measure, and it is certainly more difficult to see and hear, but it is there, and it is the most cost-effective means of marketing to ever exist. But you have to believe. Google has changed the way we access information. For the last 15 years, it has slowly impacted every portion of our lives, in most cases, making finding information easier and more relevant, and settling late night arguments a snap. Given how good Google is at providing us data, they also have an unbelievable amount of information on the habits and patterns of people who use. With that data, and 2300 or so volunteers who bought or leased a car in the last 12 months, they came out with some pretty cool information for Car Dealers on the impact of Search and other emerging technologies like Mobile, Video, and Social. I’ve combed through their Google Think report a dozen times now and wanted to share some of the data I thought was impressive and how leveraging this information can help your dealership gain a competitive edge in 2013 and beyond. Consumer Influence In 3 years, the window of time a dealer or manufacturer has to influence a new consumer has shrunk from 36 days in 2009, to 30 days in 2012. Dealers have less time to market to and convince a buyer that they have the right vehicle for them. 33% of buyers spend less than 2 weeks researching and investigating vehicles before purchasing, which is an incredibly short window. Information sources have also changed, with Online (75%) and In Dealership (76%) neck in neck for importance to consumers researching what car to buy. Traditional media is still steadily declining with Radio at 36% and Newspaper at 31%. Specifically with online sources, there are also deep shifts in the sources used by consumers: Ad Recall is also changing significantly across various mediums with Print and TV declining, Keyword Ads and Radio Neutral (No Change), and Display Advertising online increasing by 9%. Online Video 18% of online shoppers who bought a vehicle watched online videos during the buying cycle. 73% of them did it on YouTube. Here is what they were looking at: Mobile Mobile is a fast growing area with the proliferation of Smartphones, Tablets and other portable devices. It is also significantly impacting the automotive space. 33% of shoppers used their mobile devices during the buying cycle. 27% of them searched for a dealership specifically, 32% visited a dealer by finding directions on their device, and 33% used click to call to get in touch with a dealer. During the research phase of buying their car here is the information they were consuming: Social Media Everyone talks about Social Media and car buyers are no exception. Social Media so far is primarily used as a barometer for customer service, with 57% of car buyers using social media using it to read reviews vehicles, and 42% using Social Channels to read Dealership specific reviews. These patterns look like they will hold true for the balance of 2012, and well into 2013. Is your dealership ready to compete online in Search and Display advertising, Mobile Websites and Experience, Video Development, and Social Media and Reputation Management? Strathcom has the the tools and the know how to help your dealership succeed in any or all of these mediums. Give us a call today to get started. Ever wonder what kind of actionable data comes out of sending a newsletter to your database of car shoppers? Lots. If you apply the same logic that we have talked about with website analytics, you can learn a ton of valuable information about your customers and what is currently of interest, and create actionable contact lists directly from the data you collect. Most good newsletter offerings allow you to tag the different links in your newsletters to analyze who is coming from your newsletter to your website (Better yet, tag the links with Google Analytics tags, more on this another time). A good newsletter service should also allow you to track who opened the newsletter and clicked on what link. This creates an instant list of customers who have shown interest in a certain product/service/feature that you highlighted in your newsletter. Its a cost effective way to learn alot about what interests your customers and a great way to drive targeted advertising to an already captive audience. We get alot of questions about Google retargeting and how our dealers can best leverage it. This post is a quick primer on how Google Retargeting works, and how it can benefit your car dealership. Google retargeting uses a some custom code on your website to collect visitors in to audiences. Audiences can be defined in almost any way you can setup your dealer website. You could have the audience collection script only on New Vehicles if you wanted to retarget new buyers, or used vehicles, parts and services visitors, basically any area/page of your website can have it’s own audience collection. You can even collect multiple audiences on the same site (Different audiences for New and for Used Cars). These audiences are persistent, as it works by dropping a cookie on their computer, so Google can remember they belong to your selected audience. After your audience size reaches a reasonable size, you develop display ads (Graphic ads or Flash ads) specific to the type of audience you collected. If you setup retargeting to collect used car customers, then you want to show them used car ads. Now that you have an audience and an ad, as your customer browses around the internet, anytime they are served a google display ad (These are everywhere on the internet, Kijiji, TSN, The Edmonton Sun, you name it, it is probably run by Google Display), they see the ad you created for that audience. Google retargeting is really just persistent advertising for your customers who have been to your site. You can control how long they see your ads, how often they see them, and the content of them. It is a pretty powerful tool for direct advertising to customers who have shown an interest in your product. Model Specific Audience Collection. This is alot more involved, but you could tag every <insert your dealer badge here> on your dealer site, new and used and retarget customers with a discount on your on make vehicles. Body Type Specific Audience Collection. Also fairly involved but extremely powerful. If your market is bent towards a certain type of vehicle (Alberta = Trucks), you could tag all your New and Used Trucks and serve ads regarding the benefits of buying a new truck from your dealership. Service Customers. You could tag customers who Submit a service lead, and offer them upsell work between their conversion and their appointment. Maybe with them having seen 25 flush ads after they already have an appointment, they will be more receptive to the Transmission flush you offer them when they come in. The possibilites are endless, and like everything, a great retargeting strategy comes down to time, money, and effort. Don’t get started with retargeting if you are not going to properly manage every part of your campaign or don’t have the resources to handle the different aspects of ad creation, audience collection, and so on. You will literally be throwing money away. Most car dealers now measure their marketing fairly well. There are a ton of tools that make it easy, and most service providers have some kind of chart/graph/wizardry that purports to explain the Cost per Acquisition (CPA) of said service. Having said that, I have seen some highly questionable measurements come out of this. I have seen service providers in the online space measure a visit to the contact-us page of a website as an acquisition. While this is quite likely going to lead to a lead or contact of some point, it is a bit loose in my opinion. In my last post, I talked about Faith Based Marketing, which is essentially what calling a visit to the Contact-Us page is. Most of the dealers I talk to measure CPA in some way, shape, or form. Some simply allocate a marketing budget based on the number of vehicles they expect to move in a given month. With all the data that is easily available, and the ability to tag virtually every aspect of online traffic, there is no real good reason not to allocate your marketing dollars to the platforms that produce leads (and more importantly, sales). Your Dealership Website. Your dealer site is your main online marketing tool. It is where you drive everyone through your branding, SEO efforts, PPC, and so on. Your Direct Online Marketing Campaigns. Newsletters, E-Mail Specials, any digital communication direct to your existing or new client base. Your Major Online Auto Portals. Kijiji, Auto Trader, Wheels.ca, CBB, and so forth. These sites have a broad national reach. Your Local Portals. The Edmonton Journal Driving Section, Castanet, The Chronicle Herald. Sites local to your shoppers. I know how simple it seems, but I am willing to bet over 50% of car dealers are not doing this currently. All this information is readily available with a little legwork (or say, a Premium Website Solution and a Google PPC Campaign) and some monthly updates to a simple spreadsheet. This is also just the start. From this, with a proper CRM (or a more serious excel doc and a lot of legwork), you can actually narrow each lead source down to revenue, gross, and net. How many marketing dollars could you save if you knew exactly what sources drove THE MOST PROFITABLE leads, not just the most leads. Faith Based Marketing – Why? My favorite part of the automotive industry has to be marketing. After spending 2 years running the marketing department for a large auto group, it still amazes me the amount of time and money spent on Faith Based Marketing activities. In 2010, Online Advertising surpassed print advertising for the first time in history. Print had a pretty good run. 340 years or so since the first newspaper ad ran. Anwyays, back to my point. Dealers spend alot of money in newspaper. Even today, as print readership declines, here in Edmonton, if you open the Edmonton Sun, I would say fully 40% of THE ENTIRE PAPER is car dealer advertising. It is insane. The only real way to track print is to have trackable phone numbers (which are a must, not just in print), or specific website addresses to distinguish what print medium your customer came from (if you advertise in multiple papers). So, 40% of 130 pages is roughly 52 pages of vehicle ads, all with the lowest price possible, amounting to $65,000 EVERY DAY spend on a shrinking set of people reading a newspaper. And that is just Edmonton. That is a ton of bottom line dollars going towards hoping that the phone rings. Or, for other markets, maybe TV is your drug of choice. The metric used to buy TV advertising is the BBM score. A small handful of people have a box in their home that records what is being watched and by who (if they remember to punch it in). Millions of dollars spent showing your Market Priced inventory, and all you get is a small measurement of these people with the boxes multiplied over the entire population. Sounds like a fishy way to measure that kind of cash. The real value for alot of the campaigns we build is not only in delivering clicks and customers (which is how most people manage PPC campaigns), but in finding out what is not working. That is almost the most valuable take away from online advertising. It tells me what Ads I don’t need to run again, what keywords aren’t driving value, and what parts of my website are customers not interested in. Data Driven marketing is clearly here to stay, but does your dealership have a strategy to integrate it into your marketing habits? $3,000 a month goes a long way online, but buys you a couple of full page ads in the paper. Just some food for thought. A common question we get about dealer website performance is calculating a value for form leads on a dealer’s website. Google Analytics has some great features built in to handle this for you. Goal Values under the Conversions menu helps measure performance for a specific goal on the website, and in the case of every dealer we talk to, it always comes back to Leads. Goal Values are a monetary measure of what a lead is worth to you. You put in a value to define what each lead is worth based on the revenue (or gross) of the transaction associated with that goal. In the case of Car Dealers, we usually base this off of the Front and Back gross of the vehicle sold from that lead on average. Let’s say a GM Dealer in Saskatoon averages $1500 Front and $1500 Back on all his cars sold. The Average Value of a goal is $3000. You could use this number to say that every lead is worth $3000, but that would imply you close every lead from your website (and if you have a 100% closing rate online, I would love to chat with you). Taking it one step further, if you know your closing ratio online, you divide that number into $3000. So if you close 15% of your online leads (NADA industry average from 2010), your Goal Value would be $3000*.15, which equals $450. Using $450 as a Goal Value for this dealership is a good benchmark to determine what leads from your website are worth to you in real dollars. So every time a lead goes unanswered, you are throwing away $450. Tell your sales team that and you will see an immediate increase in lead responses. Thinking further along these lines, if you can increase your online closing rate from 15% to 25%, your goal value is that much higher ($3000*.25 = $750 per lead). Our dealer Training program, TOAST, speaks to how you can increase your online closing ratio just by being dilligent in your online efforts. Drop us a line to see how we can help you drive more sales.